The SEC created its own set of fake investment pages to warn Internet users of the risks of such scams. News researchers were already well aware that the Internet is flawed by an overabundance of amateur Web sites whose content was not vetted in the same painstaking way as professionally produced publications. It takes a lot of money to publish a book but almost anyone can set up a professional-looking Web site. But wait, it gets worse. In addition to accidental misinformation there is intentional misinformation. Anne Mintz, of Forbes Inc, has been following this disturbing trend for several years and is the editor of a book on the topic due out this fall. As an example, Anne showed us "www.martinlutherking.org", which on its main page appears to be an official site on Martin Luther King Jr. But it doesn't take much examination to realize that this site was created to discredit King. Similarly, the "Institute for Historical Review" has the not-so-hidden agenda of denying the Holocaust. Naturally, these sites have every right to exist and to state their opinions. But the danger is that Web searchers today will not make a distinction between these sites and legitimate scholarly Web sites. Anne also showed some examples of copycat or parody sites. For example the World Trade organization's actual Web site is at www.wto.org, but at www.gatt.org there is a site which is nearly identical -- except that the main story says that the WTO is disbanding and will cease to exist. Investment scams have been around for a long time, but the Internet makes it easier for scammers to present an apparently legitimate facade. 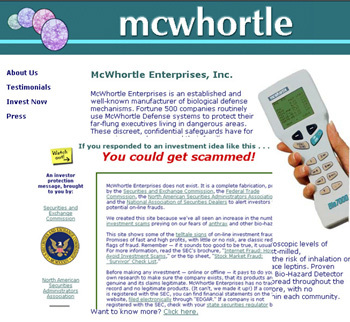 To help warn people about this risk, the Securities and Exchange Commission created sites like www.mcwhortle.com that promotes a company that does not exist. When the user clicks "invest now" the link goes to a page headlined "You could get scammed!" with an explanation of the risks. Anne detailed various types of intentional misinformation such as e-commerce fraud and the "Nigerian letter", cybersquatting or pagejacking (which is illegal), and frightening examples of medical sites that mislead. She also gave a brief checklist of criteria to use when evaluating a Web site. Although she didn't speak specifically about her upcoming book, Web of Deception, one can assume that these and many other examples of Internet misinformation will be detailed in that book, which is being published by CyberAge Books and scheduled for release in September 2002. Anne Mintz is Director of Knowledge Management at Forbes Inc. Anne oversees the Forbes information center and is responsible for online services, indexing, redistribution agreements and Internet training within the firm. For the past few years Anne has been studying the phenomenon of intentional misinformation on the Internet. In 2000 she wrote an article called "Dangerous Data Ahead" for Searcher magazine, and is also the editor of a forthcoming book "Web of Deception: Misinformation on the Internet"